How thick of a carbon steel blade do I make or do you want ? The steel I use, and have used for 30 years is 1084 high carbon tool steel. It is .062 thick or 1/16″ (4/64″ or 1.58 mm). This is about the thickness of a quarter. In my experience, this thickness provides plenty of stock for a kitchen knife. 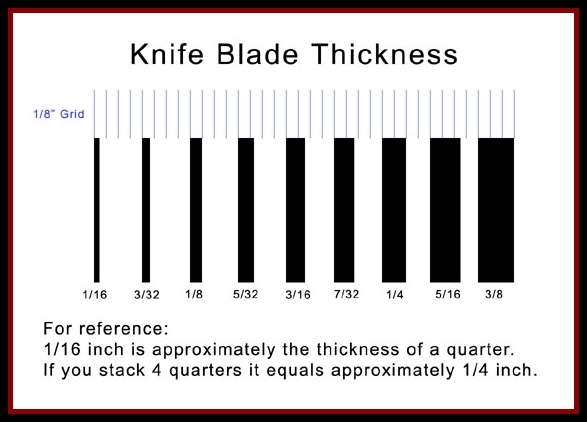 The thicker the stock, the heavier the knife and on the balance scale next to cost – for me the thickness of 1/16″ is the perfect solution to an affordable hand made knife. Cost goes up markedly when the steel I start with gets thicker. 28 years ago I made a kitchen knife using four thicknesses and used them to slice up a phone book. They all pretty much performed the same, so why not use the steel that was the most affordable and worked well, and offer thicker stock on request ? with 5/64″ (2mm) or 3/32″ (6/64″ or 2.38 mm) – your choice. This stock is made from O-1 tool steel, with 1095 carbon versus 1084 of the 1/16th” thick stock. Thicker stock weighs more. If I do not have the thicker steel in stock, I can order it and have it on my workbench usually within a week. 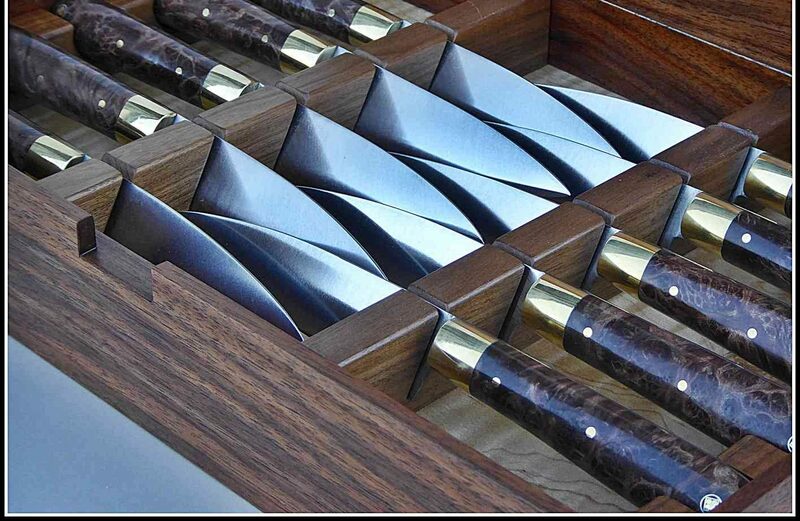 You can choose either thickness for your custom knife, and there will be an extra charge above the cost listed in the price list dependin on the size of the kitchen knife you want to order. ⇒Email me if you want a firm quote⇐. You may notice that on my ⇒Price List⇐ there are some knives which automatically come with this thicker steel – such as 3″ wide Thai Cleaver and all 12″ long blades. For these, the cost of the steel is already rolled into the price.